The new "Booster" feature enables online retailers to retarget visitors arriving through their email blasts with abandonment cart emails, without requiring them to enter their email address. By increasing the email capture rate, retailers can send more cart recovery emails, resulting in higher conversion. Barilliance (http://www.barilliance.com), the e-commerce personalization solutions provider, today announced the launch of an innovative new feature, the Triggered Email Booster, which allows online retailers to retarget any visitor arriving from their email blasts with personalized abandonment emails, without requiring them to enter their email address. This ability is now a reality with the Barilliance Triggered Email Booster. If a visitor lands on an ecommerce website from a link in a newsletter they’ve received from that site, Barilliance can automatically pair that person with their associated email. This solution enables online retailers to identify previously anonymous shoppers without bothering them for information. Deployment of the solution is simple and takes just minutes. All marketers do is add pixel code to the bottom of their newsletter template. Barilliance does all the rest. No IT skills are required, and no additional code needs to be installed. Barilliance introduced the new feature to selected customers last November. “The impact was almost instant for each and every one of the customers that added the pixel to their email blasts,” says Ido Ariel, Barilliance co-founder. 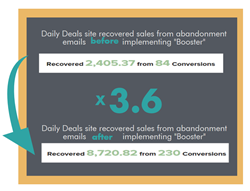 “On average, implementing the Booster feature has not only increased the number of the cart abandonment emails sent out by the retailers, but has tripled the Dollar value of the recovered sales,” he adds. “Rarely does one feature have such a direct impact on conversions, as in the case of the Triggered Email Booster,” he summarizes. 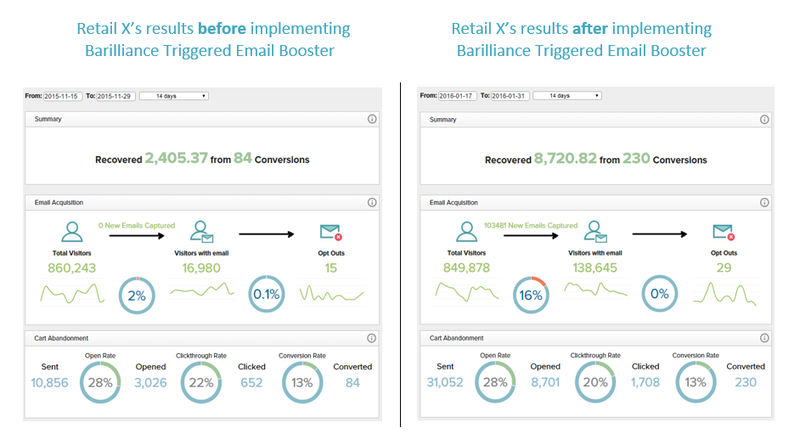 The Triggered Email Booster is only one of the features that sets the Barilliance cart abandonment email solution apart from its competitors. Offering online retailers a suite of eCommerce personalization tools, retailers utilizing Barilliance can send their customers personalized retargeting emails that contain dynamic product recommendations that are based on the visitor’s behavior on the site. The recommendations that are embedded in the email are presented in real time, when the email is opened– not when the campaign is sent out! Moreover, Barilliance also enables retailers to add personalized deals in email blasts. The personalization engine determines the product which the customer is most likely to buy and offers a discount for this product only. Barilliance is a comprehensive e-commerce personalization suite that helps e-commerce sites of various sizes to personalize their users’ shopping experience. The Software-as-a-Service (SaaS) delivery and Zero Integration technology enable online retailers to reap the benefits of the personalization technology without upfront investment. Barilliance solutions are used by over 500 e-commerce sites in 30 countries.